Despite considerable IRS fanfare in late 2009 and early 2010, a special government effort claiming to target "global high wealth" individuals completed audits on only 36 of these super high income returns in the nearly two and a half years since the program was announced. Because multiple years of a taxpayer's returns are likely to be audited at the same time, these 36 completed audits of 1040 returns reporting at least a million dollars in income may represent only 12 or 18 actual high income individuals. The agency has never provided information on the total number of taxpayers that its special high wealth auditing group is focusing on. In a December 2009 speech, however, IRS Commissioner Shulman said that the group would initially focus on individuals with tens of millions of dollars of assets or income. To comprehend the potential scope of this claim, the IRS reported that in 2010 — the last year available for this information — there were 291,831 individual returns reporting $1 million or more in total positive income. It also said that in the previous year there were 8,274 returns reporting an adjusted gross income of $10 million or more. These numbers indicate that when the minimal objective laid down by the original plan of the Global High Wealth (GHW) special unit is compared with what has so far been accomplished that the IRS has a very long way to go (see Figure 1). The findings in this latest analysis of the performance of the IRS are largely based upon internal agency reports obtained under a court order by the Transactional Records Access Clearinghouse (TRAC) at Syracuse University. While the overall achievements of various components of the special project are scanty, it is true that the records indicate they have turned up an additional $47,729,198 in taxes that IRS agents said were owed (see Table 1). * Covers 29 months since program began: October 2009-February 2012. No GHW million dollar taxpayer audits reported as completed during FY 2010. Income based on total positive income (TPI). However, Table 1 further shows that the agency closed a remarkably large proportion of these GHW examinations as "no change" audits. A "no change" audit is one where the auditors have determined that no additional taxes were owed. For the full twenty-nine months since this new unit was set up, the agency said that in fully one-third of these high-end audits no additional taxes were warranted. And, looking at a more recent period — the first five months of FY 2012 — the "no change" rate was somewhat higher, with 44 percent of such audits being given a pass. While returns without problems might be expected to close more quickly, considering the complicated tax affairs of global high wealth individuals, the fact that IRS found no issues in the reporting of their tax affairs seems remarkable. Modest Targets. One year ago, in reviewing the IRS's accomplishments for the Global High Wealth group, TRAC reported that: "while it is likely the IRS is planning to expand its audit goals in the future, at least for now they are very skimpy." One year later we can report that the targets IRS set for FY 2012 continue to be modest in the extreme. Since global high wealth individuals often create separate business entities for their different tax purposes, the primary target for these audits has been so-called "flow-through" tax entities — partnerships and S corporations — controlled by these high wealth individuals. They are called "flow-through" tax entities because any tax liabilities for these businesses flow through and are taxed on the individual's 1040 income tax return. As shown in Table 2, the target for all of FY 2011 for this elite group of GHW revenue agents was 60 partnership audits and 15 S-corporation audits; for FY 2012 it was 70 partnership audits and 26 S-corporation audits. Even including related returns, this was only a goal of 122 total audits for FY 2011 and 162 for all of FY 2012. The IRS does not report how many individuals these audits would involve. IRS's coordinated industry case program where inter-related companies were examined together typically reported something on the order of 10-15 returns per case. And recalling that an examination of this kind often must cover more than one year, it would appear that the targets set would involve a relatively small number of taxpayers. Audits Fall Behind Goals. Last year, however, the GHW unit only completed ten partnership audits and one S-corporation audit, falling far short of its targets. Currently the audit pace is picking up, but the group is still far behind the number the agency had established as its targets for just the first four months of this year (see Table 3). Thus, in the internal report card that IRS refers to as the group's "scorecard," it was in the "red zone" in each of its priority areas, falling far short of its audit objectives. * As of end of January 2012. Percent calculated also based upon IRS's four-month targets of 22 partnership audits, eight Subchapter-S audits, two large corp audits, and one F-corp audit. IRS, to its credit, was far ahead of the "Occupy Wall Street" protesters in recognizing that the tax affairs of high wealth individuals needed special scrutiny. Not only were their incomes high, but these individuals frequently favored what the IRS said were "sophisticated financial, business, and investment arrangements with complicated legal structures and tax consequences." For many years, however, the nature of the IRS's regular programs examining the returns of millionaires has been shockingly superficial. While this past year, for example, the IRS bragged that it had audited more millionaire taxpayers than ever before, 44 percent of these actions involved what the agency categorizes as a "correspondence audit" and on average only consumed 2.6 auditor hours from start to finish. And for the more elaborate "field audits" — excluding those conducted by the GHW group — it is indeed true that the agency has somewhat increased their numbers and thus coverage over the past five years. 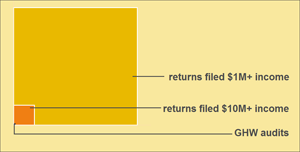 But this jump has been accomplished in part by cutting the average time spent scrutinizing each return. During FY 2007, the average time spent per millionaire audit was 41.7 hours. Last year it had fallen by 25 percent to 31.4 hours: more audits, but less time spent on each. So far in FY 2012 the time per millionaire "field" audit has fallen even further to an average of only 15.6 hours. This latest drop also has been accompanied by a shift from using experienced revenue agents to relying on lower-cost tax examiners. This means that most so-called "field" audits now resemble a mere correspondence audit (see Table 4). * Income based on total positive income (TPI). ** In FY 2011 only 23 out of all audits by tax examiners; thus far during FY 2012 10,023 audits of the 16,623 audits were by tax examiners. IRS data do show that millionaire audits — regardless of method — turn up substantial tax underreporting. In FY 2011, regular IRS audits found $5.1 billion in income tax underreporting among this select group of audited taxpayers. But 87.5 percent of millionaire returns were not even examined. So even the relatively small number of superficial examinations of these returns turns up substantial reporting errors. But for this class of taxpayers, most of whom may have complex financial affairs, it remains an open question whether the once-over-lightly audits generally favored by the IRS may in the long run actually be counter-productive if they miss most questionable tax underreporting all together. This was noted by the IRS Tax Ombudsman in her report to Congress this year focusing on the need for adequate funding of IRS operations: "[C]ompliant taxpayers who see that the IRS is not able to pursue noncompliant taxpayers adequately begin to feel like 'tax chumps,' potentially making them less likely to comply in the future, particularly in the case of small business taxpayers for whom paying taxes may place them at a competitive disadvantage." One thing is clear: while the IRS announced that the tax affairs of all high wealth individuals will be thoroughly scrutinized by this new GHW group, two and a half years into the program the agency still has allocated very limited resources towards this ambitious initiative. Only 101 revenue agents have been assigned to this group. The other groups making of the Large Business and International (LB&I) Division on average have ten times as many revenue agents (see Table 5). * As of January 31, 2012. Size of GHW group unchanged since 2011. Whether judged by the limited number of audits of "global high wealth individuals" or by the limited resources assigned, this program has not lived up to the fanfare with which it was announced. The IRS Commissioner may need to speak with less hype and more honesty about the sufficiency of agency resources to ensure that high wealth individuals are receiving adequate audit attention. Clearly the program has not yet achieved what the Commissioner promised when it was created: the delivery of a "game-changing strategy" for the IRS that will give the agency "a unified look at the entire complex web of business entities controlled by a high wealth individual." The Treasury Inspector General for Tax Administration in its Audit Plan for FY 2012 announced that it will be reviewing the program this year to "[d]etermine the effectiveness of the Global High Wealth Industry Unit's efforts to improve compliance among high wealth individuals."